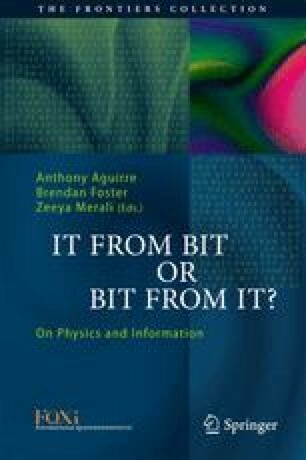 John Wheeler coined the phrase “it from bit” or “bit from it” in the 1980s. However, much of the interest in the connection between information, i.e. “bits”, and physical objects, i.e. “its”, stems from the discovery that black holes have characteristics of thermodynamic systems having entropies and temperatures. This insight led to the information loss problem—what happens to the “bits” when the black hole has evaporated away due to the energy loss from Hawking radiation? In this essay we speculate on a radical answer to this question using the assumption of self-similarity of quantum correction to the gravitational action and the requirement that the quantum corrected entropy be well behaved in the limit when the black hole mass goes to zero. Published in JHEP 1405:074 (2014). There are two works—one on self-similarity  and one on the peculiar relationship between long distance/IR scales and short distance/UV scales in quantum gravity —which helped inspire parts of this work.